8x8 is in the Gartner Magic Quadrant for CCaaS Again | 8x8, Inc.
8x8 is in the Gartner Magic Quadrant for CCaaS Again! For the fourth year in a row, 8x8 is a Challenger in the Gartner Magic Quadrant for Contact Center as a Service, North America in 20181. 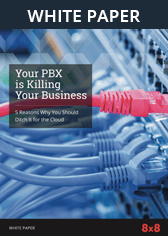 See how 8x8 X Series makes us different—and why you should consider the cloud when expanding or replacing on-premises contact center solutions and legacy business phone, messaging and conferencing services to speed time to resolution and transform customer experience. Learn why 8x8 has not only been recognized in the Contact Center as a Service Magic Quadrant for the fourth consecutive year, but was also named a UCaaS Leader by Gartner in the 2018 Magic Quadrant for Unified Communications as a Service, Worldwide2 for the seventh consecutive time. Don’t make critical decisions about your contact center without first knowing what Gartner, the world’s leading information technology research and advisory firm, has to say. Gartner does not endorse any vendor, product or service depicted in its research publications and does not advise technology users to select only those vendors with the highest ratings. Gartner research publications consist of the opinions of Gartner’s research organization and should not be construed as statements of fact. Gartner disclaims all warranties, expressed or implied, with respect to this research, including any warranties of merchantability or fitness for a particular purpose. Report name has changed 2015 onwards. 2015-2018 report name: Magic Quadrant for Unified Communications as a Service, Worldwide. 2014: Magic Quadrant for Unified Communications as a Service, North America With Additional Regional Presence – 28 August 2014. 2012-2013: Magic Quadrant for Unified Communications as a Service, North America.